Often perceived as the darkest place in the Nordic region, for whatever misguided reason, Finland has at least managed to produce a movie that could be taken for an American effort. There isn’t always something wrong with Scandinavian storytelling, even in horror movies, but local acting can sometimes kill (if you pardon the pun) an otherwise good story. The producers of Dark Floor tried to rectify that by casting only Americans, a strategy that enables viewers to judge the movie more as just another American film, rather than “foreign”. In Dark Floors you can forget about fake accents and wooden theatrical acting even if the film is from Finland. Any movie made in Finland, horror or not, may be hard to get into for people who don’t speak Finnish, but one of the interesting things about Dark Floors is that the cast is all Americans. This doesn’t necessarily make the acting better, but it gives the film less of a “Finnish” feeling, and it should really be compared to American medium sized horror movies, rather than other Nordic films. As the special effects are quite good too (a mix of physical, make-up and digital) and art direction is top notch, you will soon forget it’s a Finnish movie and judge it on par with “normal” horror films from the UK or USA. And that is perhaps the big weakness of the film. A Finnish movie can never compete with American films in terms of budget or size, so what is left is the story, and while directors and writers from any country can impress with great stories, it becomes more evident here that the story isn’t all that original. There are many repeats, like a video game with several levels and each level is the same, except a little tougher with more monsters coming at you. Dark Floors‘ terrors are a mix of ghosts, monsters of the week and evil children, but not particularly inventive; monsters attacking you from dark corridors, ghosts coming to grab you from beyond a wall, backed up by a group of standard characters such as the wise and creepy old bum, the coward egoist, the hard black security guard, and so on. Also, it is not quite clear where our heroes have arrived and why, but I guess the point was more to show off monsters. 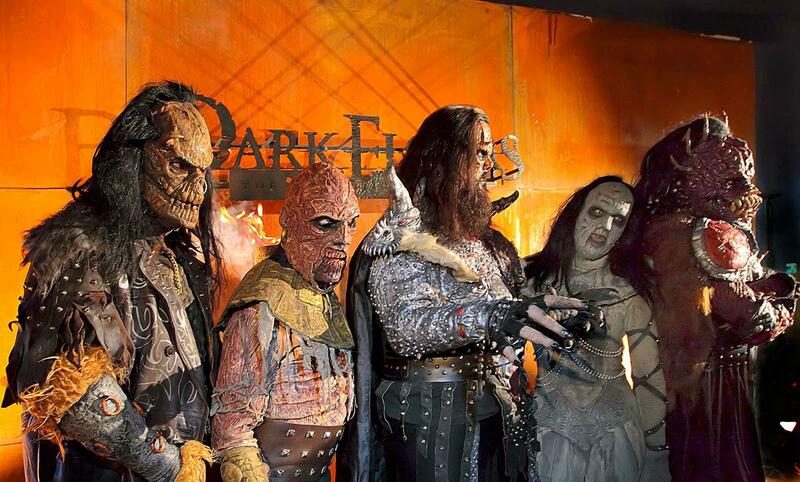 Yes, the inclusion of Finland’s horror rockers Lordi is interesting and fun for those into goth rock and stage theatrics. The band actually won the world’s biggest music competition Eurovision Song Contest in 2006 with their elaborate costumes and scary masks, and it feels like a ntural step for them to put their monsters in a horror movie. Unfortunately they are applied like any other monster of the week, making their appearance more important for their fans than for casual viewers. 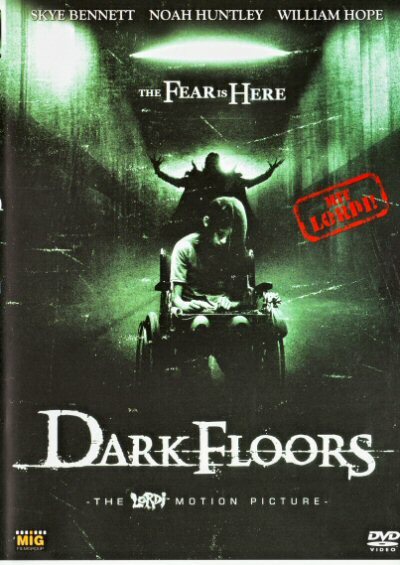 Even so, Dark Floors is technically well made and has a good atmosphere of insanity and hell. And if you want to, the story can be seen as social commentary in the sense that you will enter hell if you enter the American medical system without proper insurance. From a European viewpoint, and as explained in Michael Moore’s Sicko, you should never get sick in USA. Hospital, American actors, monsters in stead of doctors… it’s a bit obvious, but then again it’s primarily a horror movie and not a political debate. Dark Floors is mildly entertaining but could have gone further, had it not been tailored to a teen audience of casual fans and Lordi followers.